The winner announcement is here and the race will be in just one week. The winner for the Allstate Life Insurance Atlanta 13.1 Marathon has been randomly chosen and it is time to give one lucky runner the opportunity to run for free! Before we get to the announcement, make sure that you sign up with the discount code QUEST10OFF131 if you are not the winner. The code is good until online registration closes in the next few days and is only good for the half marathon distance. You may want to think about registering today since the next price increase is tonight. The long awaited... overdue... winner announcement is finally here. The winner for the Allstate Life Insurance Atlanta 13.1 Marathon has been randomly chosen and it is time to give one lucky runner the opportunity to run for free! Before we get to the announcement, make sure that you sign up with the discount code QUEST10OFF131 if you are not the winner. The code is good until online registration closes and is only good for the half marathon distance. 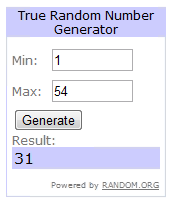 There were a total of 54 entries which I ran through random.org. The lucky number came up as 31 and the lucky winner is....... Jack Bruce, proving that more isn't always better, sometimes you just have to be the lucky one :) Jack - please email me at info@262quest.com and I will get the instructions over to you on how you can register. Keep your eyes pealed, as rumor has it that I have one more opportunity to win coming up very soon!